Surprise your Mom this Mother's Day with this beautiful and exotic dendrobium orchid arrangement. 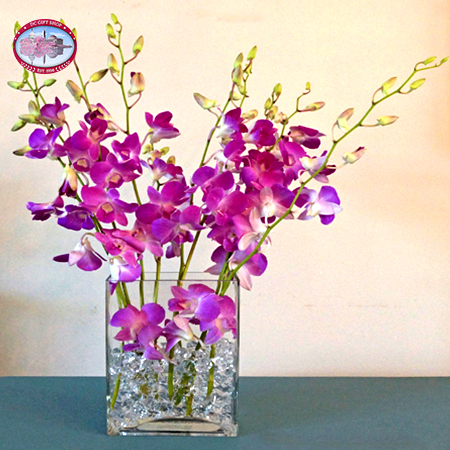 These dramatic, purple orchids come in a stunning glass rectangular vase that stands eight inches tall. Also included are decorative diamond-colored acrylic pieces that complete this ten piece orchid flower arrangement. Orchids are famous for their natural sophistication so please your mother on her special day with these flowers delivered right to her doorstep. These purple orchids should be kept out of direct sunlight and will last between one to two weeks for your mother to enjoy.